"Pinot Noir or Zinfandel? What's the best organic wine? Go from novice to knowledgeable with this easy-to-use, pocket-sized guide. Top 10 lists provide instant, practical advice to help you make selections - from the 10 best wines for laying down, to the greatest reds, tastiest whites, organics and dessert wines, or the 10 best-kept secrets. Drink in advice on tipples from reading wine labels, to buying, storing and matching wine to food. 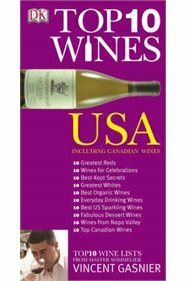 Plus, there's a comprehensive look at the major winegrowing areas of the USA and Canada, from the Napa Valley to Washington State and Canada to New York State, to the best producers and wine styles in each area. Discover the top wines of today with this handy guide."